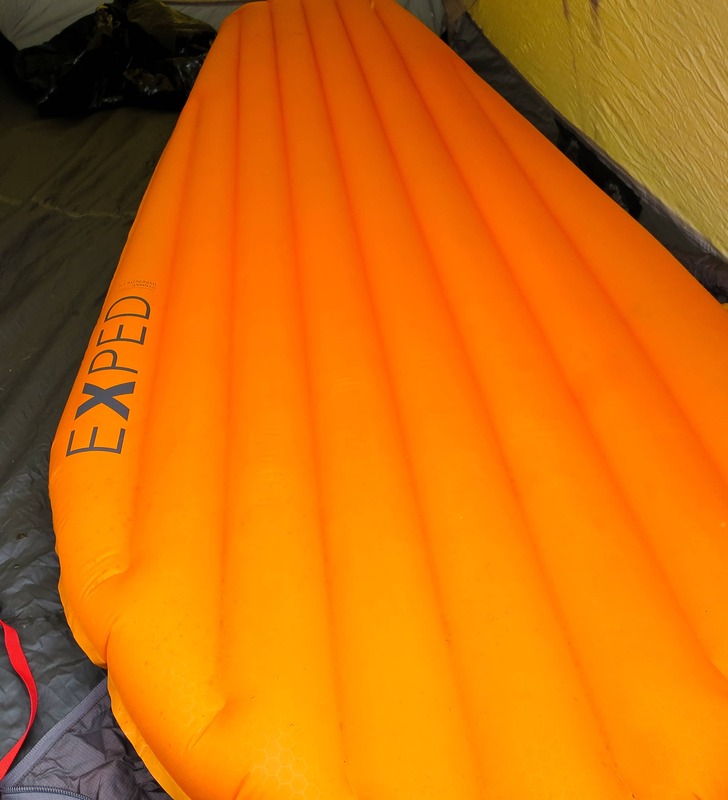 Exped is known for making some of the best sleeping mats available anywhere. However, like many people I’ve only every tried their down fill mats, never a synthetic fill. To find out how their synthetic mats perform we decided to test out the SynMat Hyperlite. This tapered, 3-season mat is sold as the lightest mat for its warmth which I take to mean that it’s lighter than competitors’ mats with the same R value. A bold claim and I was excited to see how it would perform. How comfortable is it? How easy to inflate? How packable? Well after spending over 40 nights on it I’m impressed, this is a great mat! 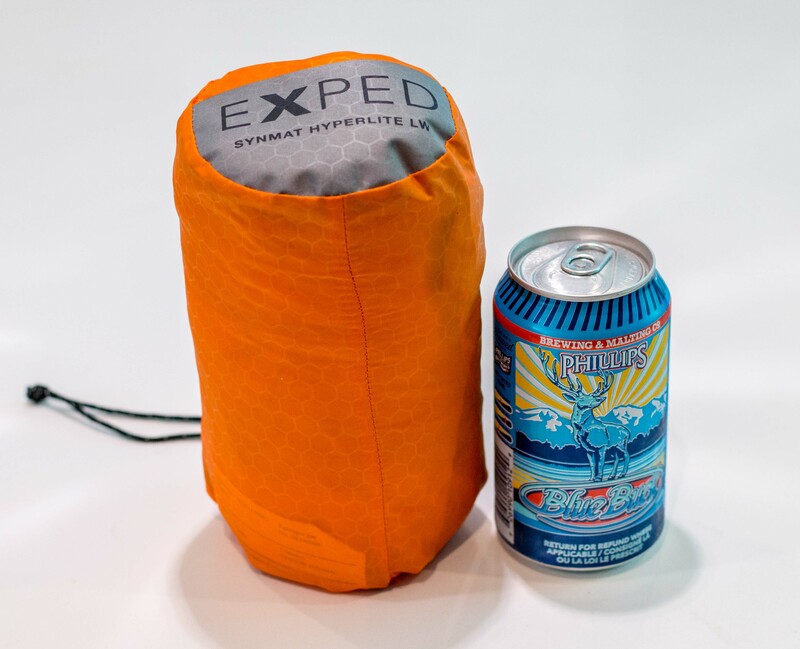 Exped SynMat Hyperlite next to can of beer for size comparison. As you can see the bag is quite tight and it takes a bit of work to get the mat small enough to fit. One of thigs that I really liked about my original Exped mat, the UL 7, was the soft feel of the mat and the quiet nature fabric. There was no squeaking or crackling when I rolled over and it just felt nice to lay on. Well, I was pleased to find that all these great aspects have translated over to the Synmat Hyperlite. The exterior fabric has a nice soft feel to the touch and when laying on it and the mat doesn’t make a bunch of noise when I roll around. There is a slightly different set-up on the inflation/deflation set-up on the Synmat than there is on the down mats. Instead of the double 1-way valve system that the down mats have the Synmat Hyperlite has a single 1-way valve that holds air in the mat. 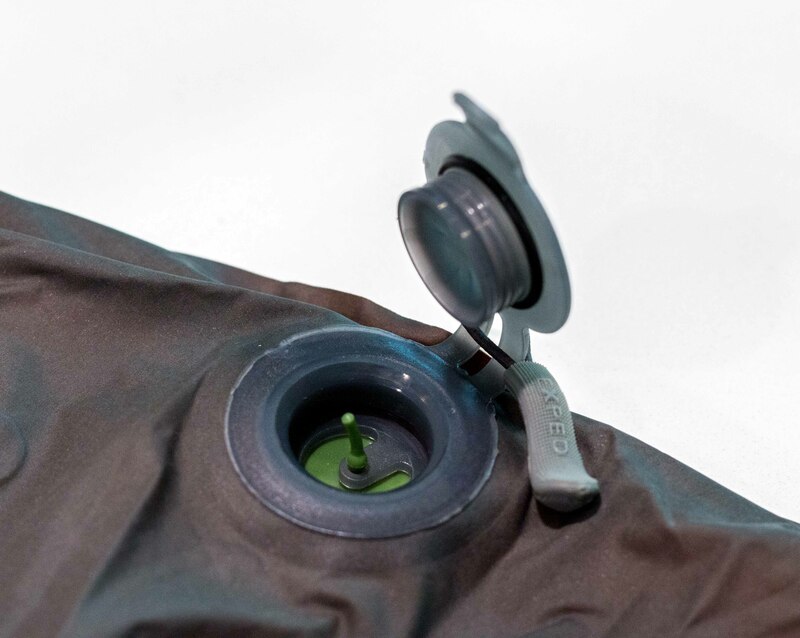 To deflate it there is a zipper pull tab attached to the valve cover that you push into the one-way valve to release the air. Simple and effective. Unfortunately the mat does not come with the bag pump. If you want one you can buy them separately. The valve assembly for the SynMat Hyperlite. The zipper pull is used to deflate the mat. The Synmat Hyperlite is warm for a 3-season mat. I’m not sure if Exped is just conservative with their ratings of other companies overstate them a bit but this mat is noticeably warmer than other similar mats that I’ve used. Most importantly however, the mat provides a great sleep. It is thick enough (7cm) to provide good cushioning without pressure points or cold spots even when I was sleeping on my side which I do a lot. One other nice feature, which I mentioned earlier, is that the fabric doesn’t make a lot of noise when tossing and turning. Lastly, the bag that the Synmat comes in is quite tight and takes a bit of effort to get it to fit. At least for the LW model that is. The SynMat Hyperlite has a tapered shape, wide at the shoulders and narrow at the feet. The LW (long-wide) model is the largest of the three available models. There’s been about 40 night’s worth of testing on this mat in a variety of locations, mainly in the alpine on rock or snow. The mat material has a durable feel and has stood up well with no punctures or evidence of wear and there has been no valve issues. However I did experience a baffle failure. This creates a high point where the interior baffle failed making the mat less comfortable but still functional for the trip. This type of failure is eligible for warranty and is more of an inconvenience than anything else. The cause is likely over inflation as I used the bag pump to get the mat quite firm with cool evening air and then it got quite hot in the tent the following day. Despite this one issue the mat is very durable and reliable overall. I just plan to deflate all my mats a little in the am to avoid baffle issues in the future. Pros: Very comfortable and soft to sleep on, the fabric of the mat is quiet and it sleeps warmer than other similar mats and of course it’s light and compact. Cons: Doesn’t come with the bag pump but it can be bought separately, hard to stuff into the storage bag. Overall: If you want a great sleep and don’t mind spending a little extra money this is the Cadillac of backcountry sleeping mats. You won’t be disappointed! A sample was provided for testing but of course did not influence the review in any way.